Bar Harbor is a town with a lot of history. The 1932 Criterion Theatre lives in a building with a particularly rich history, which it manages to preserve while also putting on programming for modern times. Admittedly, I have a special place in my heart reserved for The Criterion after they hosted one of my all-time favorites, Brett Dennen, this past August (it was a really big deal in terms of nostalgia and one of the only things that would have lured me out of the house in the first week after giving birth), but this post goes beyond my own reasons for loving the Criterion. Community Involvement. It’s always nice to see businesses and nonprofits in the community banding together to create something that we can all enjoy. This winter alone, The Criterion has joined forces with other local businesses to put on various events, such as a Star Wars Costume Parade with Atlantic Brewing during the opening week of The Last Jedi. 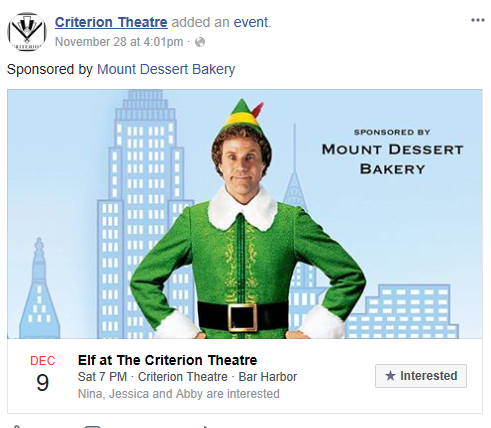 They’ve also created a Christmas movie series, where local businesses can sponsor a Christmas movie of their choice. And then there’s the upcoming Spectacular New Year’s Eve Carnival with The Barn Arts Collective, an event for the whole family from 2-4 p.m. Mix of Live Events and Movies. In addition to blending past and present, the Criterion also blends live events with film (not at the same time, of course). These events are separated out on their website. Live events include concerts by local favorites and well-known celebs (Clint Black and David Crosby, for instance), performances (like the Acadia Community Theater’s Christmas in Oz earlier this month), and the occasional visit from the ballet. A list of upcoming movies is also available both on the website and Facebook. It never hurts to have this information in more than one place! All the information you need, in an easy-to-find layout. Marketing with a Smile. When it comes to marketing, finding a blend of informative and humorous can be a delicate balance. They aren’t afraid to show their goofy side (see below) which makes for interesting content. After all, you might as well have a little fun with your marketing! Online Purchasing. This past summer, I went to see two concerts at the Criterion with my mom. For both of them, we were able to buy our tickets in advance online, which made the process super easy. If you want to secure seats ahead of time, make a gift of tickets to a show (or their ticket booklet), or become a member, you can do it all from the convenience of your home (which is especially appealing during the winter months). A clever thing in their checkout process also allows you to round up your purchase to the nearest dollar to make a donation or give a donation as a separate line item as you check out. In terms of event marketing online and offline, The Criterion is a nonprofit to take notes from. For our area, summer is an important time for the local economy. From Memorial Day Weekend to mid-October, the area comes alive with businesses reopening for the season and lots of visitors. As marketers, we tend to have a watchful eye on what different businesses are doing to succeed in the summer market. Sidewalk Fun. You’ve probably seen posts go by picturing clever sidewalk signs in front of restaurants. 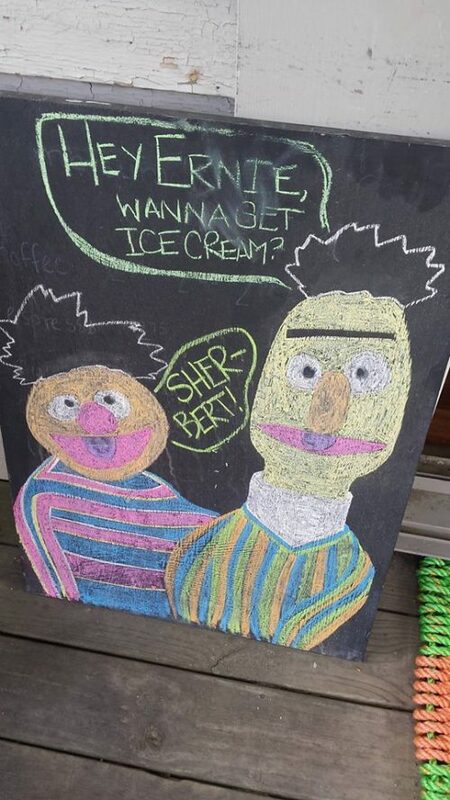 We’ve seen some from local businesses like MDI Ice Cream that are witty and well-illustrated. If done well, sidewalk sings/art can have roughly two different effects. One, it catches the attention of people walking around on foot, and they decide to check your business out. Two A, you take a picture of your sidewalk creation and share it on social media, where it can reach a wider audience (and puts you on the radar of people who aren’t around to see it IRL). Two B, the aforementioned people walking around town are so entertained by your sidewalk creation that they take a picture and share it on their social media. This has a similar result as Two A, but with an entirely different audience. Outdoor and Indoor Options. Some people like to sit inside and others prefer outdoor seating, and most places (at least restaurants) have options for both indoor and outdoor seating. And it’s not just an idea for people who sell food or refreshments. I remember being a kid and walking around small coastal towns where my mom would want to go into a store or business that wasn’t really fun for a kid. And since we were walking around, I wanted to park it somewhere. Maybe it’s a bench outside, or places to sit inside, but it’s definitely a nice touch to have something on the outside and something on the inside, ideally a place for people to sit a spell and look around at your fabulous business. If you really don’t have space, try to put out a dog water bowl. It gives a friendly, laid back touch… and gives dogs walking by a reason to stop and rest. Directions and Referrals. Every now and then, people stop in to ask us for directions to a certain business, a place that sells/has X, or just recommendations in general. This just requires having a general knowledge of the area. Most people want to know about dog or kid friendly places, good hiking, where to find a lobster meal or ice cream, or want to know what a local would recommend. To handle these requests offline, you could have maps of the area (if there are any available) on hand to give out or refer to. In terms of online requests, you could dedicate a page of your website to “Things to Do” or “Our Favorite Local Places.” You could even get each employee to contribute their top recommendation for visitors. Have physical copies of business cards or rack cards of your favorite places ready to go… and those businesses may do the same for you. Online Menus/Information. A lot of travel-savvy people will do some reconnaissance before finding a place to eat, and the first place they’ll look is online, either a website or Facebook. Fortunately these are easy to set up, it just requires a bit of data entry. There are also plenty of free apps that will display your menu and allow for easy updates. I’ve used both MenuTab for Facebook and OpenMenu (which has you build one menu and lets you share everywhere, as opposed to entering the same information 3 times in 3 different places). Think of making frequently asked questions like tour times, services, and more easy to access from your website and social media. As we head into a holiday weekend, some of these ideas may give you some of your own ideas for marketing in the summertime. At the very least, you’ll want to have the local ice cream places memorized! They Care. There’s a lot of work that goes into each batch of ice cream here. A couple years ago, we had the opportunity of helping load up the trucks with gallons of ice cream from Bar Harbor to Portland, and got a taste of the labor intensive end of the ice cream industry. And that was just scratching the surface of what goes on behind the scenes. First, their ice cream contains at least 16% butterfat (most ice creams start around 14%), based on owner Linda Parker’s assessment that it “is the precisely right amount of butterfat.” Based on what we’ve seen and tasted, Linda knows her stuff! They also make their own flavors, rather than relying on commercial mixes, which a) makes the ice cream taste WAY better, and b) takes WAY more time to make. Even after years of business, they’ve held on to their belief in quality over quantity (be it of ice cream or extra time). The Location. Both locations in Bar Harbor are in easily accessible places along the street, perfect for foot traffic. Besides this, both locations offer a couple different seating options for the people who want to sit down and enjoy their ice cream in the shade/under cover or those who prefer outside seating (pictured below is the infamous blue bench outside the Firefly Lane location). My personal favorite is heading to the Village Green- there’s nothing better than ice cream and people watching on a summer afternoon. 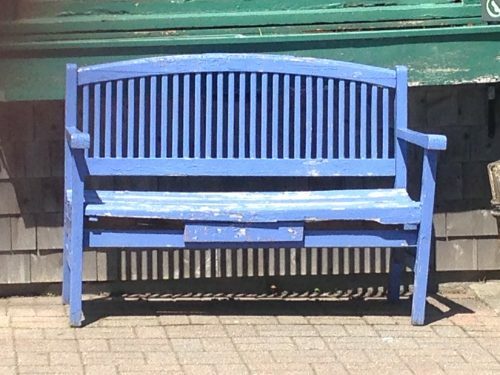 The blue bench outside Firefly Lane is prime seating. Social Media. MDI Ice Cream is pretty great at keeping their Facebook and Instagram (@mdiicream) presences up-to-date with openings and new flavors. They also have some fun with their street signs (which you can see below). Following their social media helps you keep tabs on all their locations, and usually includes a scoop of humor as well! From the MDI Ice Cream Facebook page. Fearless Flavor. 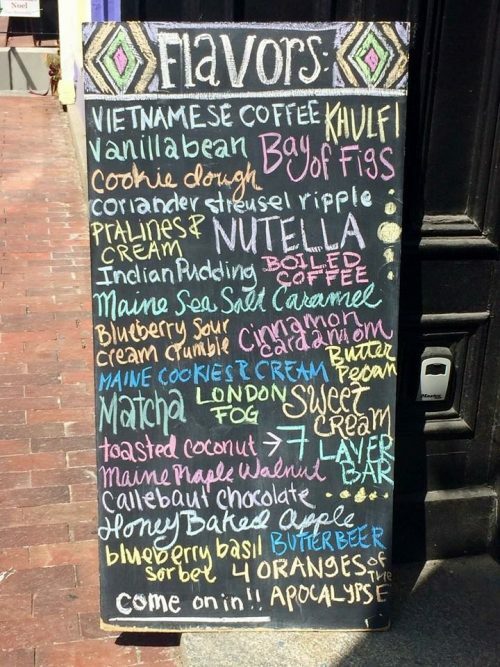 Besides the classic standbys (looking at you, Sea Salt Caramel), there’s always room for innovation at MDI Ice Cream which is a great business model in general and even better when it comes to ice cream. As mentioned earlier, there’s nothing artificial about their flavors or coloring. Some of their flavors include Beet Ginger Sorbet, The Dude, Thai Chili Coconut, Butterbeer, Bay of Figs, and many more. Plus, you can probably tell from the sign, but innovation is included as part of the business. New flavors can be found on deck (after rigorous rounds of testing, of course) every year, and Cookie Dough is new for this season. Another thing- you won’t get ice cream drowned in sprinkles or other sugary, candy toppings. This is ice cream in it’s best, raw, natural state- I’m hamming it up a bit here, but honestly, it’s another way MDI Ice Cream stands by their product and stands out from the crowd. When it comes to a local business with great marketing and a quality product, the proof is in…the ice cream. Thanks for feeding our summer appetites, MDI Ice Cream! When being in business for awhile, like being in any relationship, it can be easy to get into a rut. You find what works and do more of that. You get into a routine and go along your way, nose to the ground. Problem: We have had literally hundreds of clients from people who came to one $25 workshop to people who have collectively spent over $10,000 with us throughout the years. In just doing what we needed to do (i.e. our routine), we hadn’t reached out to these people in awhile. Solution: For less than half the cost of a direct mail campaign (yes, we did price one out), we sent all our our past and current customers a copy of some custom drawn greeting cards. We worked with local illustrator Jill Lee and local printer Print Bangor to come up with some fun ideas and packaged them together with some bright envelopes that were not only in our brand colors, but would stand out in someone’s mailbox or on someone’s desk when clients sent them out. Here is the artist’s portfolio of the ‘local’ cards. Here is the artist’s portfolio of the ‘internet’ cards. I honestly sent these out with pretty low expectations. I knew that, since this was a package, everyone who got it would at least open it, unlike a sales flyer. I thought if we got some business out of it, great. I thought if I could sell the spare prints of the internet cards online, double great. But honestly, it was just fun to send out a gift. Really. I didn’t hear from everyone, nor did I expect to. But the right people ‘got it’. And several people loved them. And that’s all I wanted. As you see, since it was designed, printed, and packaged/processed locally, almost half this money stayed locally (with either BEC employees or subcontractors/service providers) and I’m as happy about that as I am at how cool the cards turned out. How Could This Story Be Better: Normally, I am the kind of person who always has a reason for doing something. People who like me would call this logical and people who don’t would call it having an agenda. But this utilitarian approach has honestly kept us in business (and growing) mid-recession in an industry that’s considered icing on the cake rather than the cake itself. This project was one of those rare times I let myself act on a gut feeling. To me, spending about $3000 to make people happy was an okay thing to do. I’ve bootstrapped this business for eight years and it was nice to give a little something. The only way I can think of this story being better is finding more ways to make people smile and understand just how grateful I am for their patronage. It’s a new year, which means that many of us have started out the year with resolutions to eat healthier and start working out. After a couple months off for an end of season break, Thrive in Bar Harbor has re-opened with new hours and a new menu. We’re pretty excited, and here’s why you should be, too. Salad by the pound. One of my favorite things about the Bates College Dining Hall was the “choose your own adventure” aspect, and the climax occurred at the salad bar. Thrive’s new salad bar setup brings me back to my college days (in a good way). 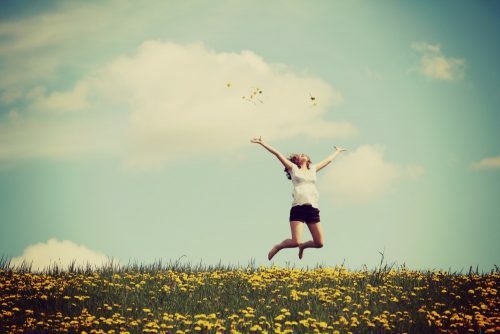 You get to pick out only the stuff you actually want, and as much (or little) as you want. Online ordering. If you have a limited lunch break, Thrive’s online ordering option is perfect. You can access through Facebook or their website and schedule for pickup now or later, whatever works best for you. Personally, I love the ability to order online because talking on the phone is my nightmare, even when amazing food is on the table. If you’re in a rush but don’t have computer access, they also have a “Grab and Go” selection of pre-made meals prepared that morning. Convenient plus nutritious = win-win. It’s easy to see where your traffic comes from online, with the help of tools like Google analytics, but for brick and mortar establishments who want to know where their traffic is coming from, it can be a bit trickier. These cards encourage customers to share how they heard about either place. Local Businesses Supporting Local Businesses. The idea of “Thrive” goes beyond reaping the benefits of a healthful diet, there’s a community element, too. Thrive’s ingredients are, as often as possible, from local sources, like Mandala Farm in Gouldsboro. Thrive also recently partnered with Destination Health, a new fitness studio in Bar Harbor, for a New Year’s Resolution wellness program. Fostering these community relationships in creative, helpful ways is something we definitely appreciate. If you haven’t already stopped by Thrive or checked them out online, I recommend that you do both. Looking forward to having this option nearby all year long! You can also hear more about Thrive’s mission by listening to their interview on the My Desert Island podcast a couple weeks ago.